Skillet-cooked until golden brown, then served with sour cream and chives, these potato pierogis are nothing like the kind you get from the freezer section! Combine flour and salt in large bowl. Cube half the cream cheese. Add to flour mixture; cut with pastry blender or 2 knives until mixture resembles coarse crumbs. Add egg and warm water; mix until mixture forms ball. Place on lightly floured surface. Knead 5 min. or until dough is smooth and elastic. Mix remaining cream cheese with potatoes, onions and pepper until blended. Roll out dough on lightly floured surface to 1/8-inch thickness; cut into 48 (3-1/2-inch) rounds, rerolling trimmings as necessary. Spoon 1 Tbsp. potato mixture onto center of each round. Lightly brush water around edge of each dough round; fold in half to enclose filling. Seal edges with fork. Bring large saucepan of water to boil. Add pierogi, 12 at a time; cook 3 to 4 min. or until they float to the surface. Remove pierogi from water with slotted spoon; drain. Melt 1 Tbsp. butter in large skillet in medium heat. Add 1/4 of the shallots and 12 pierogi; cook and stir 4 min. or until pierogi are golden brown. Repeat, in batches, with remaining butter, shallots and pierogi. Mix sour cream and chives until blended. 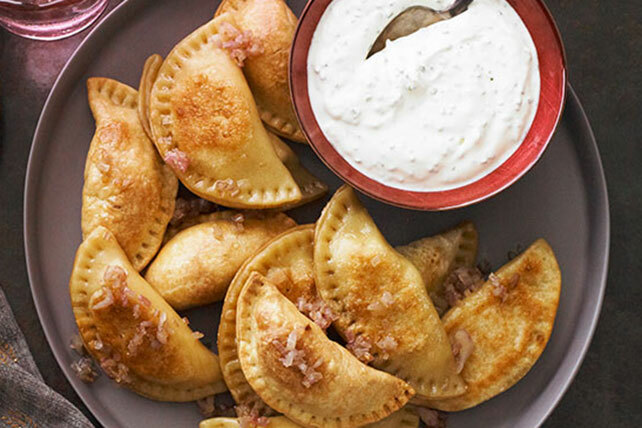 Serve with the pierogi. Prepare pierogi as directed but do not cook; place in single layer on baking sheets. Freeze until firm. Transfer pierogi to freezer-weight resealable plastic bags. Freeze up to 3 months before cooking as directed. No need to thaw first.